MONO COUNTY, Calif.​– Cross-country skiing in the Eastern Sierra is an experience of unparalleled scenery, serenity, fitness and fun for beginners to experts, thanks to the varied terrain and unrivaled backdrop of the Sierra Nevada landscape. Tamarack Cross-Country Ski Center in Mammoth Lakes is the largest Nordic resort in the region with 30 kilometers (19 miles) of cross-country skiing trails that wind through breathtaking alpine scenery. Summer’s paved roads in the Mammoth Lakes Basin, linking five lakes, become miles of groomed cross-country ski trails in the winter with views of the Mammoth Crest, Sherwin Ridge and Crystal Crag. Opens Nov. 21, 2015, conditions permitting. Shady Rest Park, right in the Town of Mammoth Lakes, also provides a 1.8-mile groomed track, free of charge, weather permitting. Enjoy a more remote Nordic skiing experience at the Rock Creek Lodge, which offers winterized overnight cabins, 15 kilometers of groomed track, access to back-country terrain, as well as fine dining in a forested, ski-in setting. A snowmobile taxi is available for guests checking in, and every evening to bring folks up for Adventure Dining – a four-course, prix fix gourmet menu, served family-style. Reservations are required. Open mid-December through the first weekend in April. Silver Meadow in June Lake makes for a great cross-country ski for families or beginner skiers, thanks to its easy two-kilometer track, but the stunning scenery below the Sierra Crest makes it a must-do for all ability levels. Free; open and groomed based on snow conditions. The right amount of snowfall allows for cross-country skiing at Mono Lake which can be an “otherworldly” experience with the occurrence of freezing fog, called “pogonip.” The icy fog laces and layers the famous limestone tufa towers with a delicate, sparkling sheen of ice crystals. Follow directional signs to South Tufa from SR 120 East, off US 395. Contact the Mono Lake Committee Visitor Information Center (open year-round), for more details. Bald Mountain and Obsidian Dome between Mammoth Lakes and June Lake, just off U.S. Highway 395, are also popular cross-country ski areas, when conditions permit. The dark, volcanic Obsidian Dome is set off in stark contrast in snowy conditions and shouldn’t be missed. Free; Obsidian Dome track is groomed periodically by the Inyo National Forest Service. At the northern end of Mono County, the Bridgeport Winter Recreation Area off Sonora Pass Road (SR 108) is open for winter adventuring. Again, depending on snow conditions, this multi-use wilderness area welcomes advanced cross-country skiers, snowshoers, and snowmobilers to explore the spectacular mountain terrain. Day-use permits are mandatory but free of charge. Stop by the Bridgeport Ranger Station located just south of Bridgeport on US 395, or click here for more information and to fill a permit out in advance. 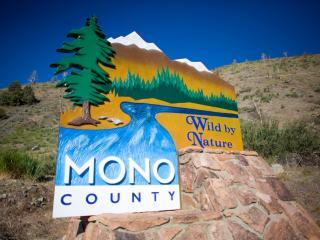 To find out more about cross-country skiing in Mono County, or dining and lodging options, call 800-845-7922 or go to www.monocounty.org.